Simply looking at music should not be a frightening experience. This is especially true if you are not expected to perform it. Nevertheless, upon seeing a music score, many are frightened by the overwhelming number of notes, lines, curls, and other markings. It would be of benefit to review or learn some of the basics of a score and the orchestra. How did the orchestra come to be? To put this question into perspective, it would be helpful to look at other, more recent “standard” instrumental ensembles. For example, to many in the 1940s the standard components of a big band were five saxes, four trumpets, four trombones, and a rhythm section. A parallel can be seen in a rock band of the early-to-mid 1960s consisting of a lead guitar, rhythm guitar, bass guitar, and drums. There’s a similarity to the standard orchestra of the late eighteenth century. It consisted of pairs of woodwinds (two flutes, two oboes, two clarinets, and two bassoons), horns, timpani, and string choir (first violins, second violins, violas, cellos, and basses). And, just as there were many big bands that had alternative instrumentation (e.g., fewer trombones or a lead clarinet) and many rock bands that consisted of alternative instrumentation (e.g., piano, Hammond B-3 organ or blues harp), few orchestras were exactly this instrumentation. Sometimes there was only one flute, no clarinets, one oboe, one bassoon, three horns, some trumpets, or some trombones. Just as the late eighteenth century and at least the first half of the nineteenth century saw upheavals in society, economics, industry, science, and religion, so too, technology and the arts (especially the financing thereof) had their share of turmoil. There were introductions of new instruments and even new instrument families. The nineteenth century saw the introduction, to the woodwinds alone, of the piccolo, alto flute, English horn, E-flat clarinet, bass clarinet, saxophone, and contrabassoon among others. Another new instrument that came into widespread acceptance around the turn of the nineteenth century was the piano. A traditional symphony orchestra can be divided into four sections: woodwinds, brass, strings, and “other.” Many musicians know that the “other” section usually contains the percussion in the form of the timpani for the earlier period discussed here. In later orchestras, “other” could include one or two harps, cymbals, bass drum, snare drum, celeste, glockenspiel, organ, and xylophone among others. The string section is the most sonically homogeneous of the sections. In addition to sounding similarly, the four different instruments of the five sections of the strings can perform almost all of the same techniques. An orchestra is the instrument played by a conductor. Like an instrumentalist learning to play a piece on the piano, violin, or saxophone, the conductor learns a piece by studying the score. He or she then develops an interpretation, which comes after learning the piece. Just like a pianist, for example, cannot get to the point of focusing on the interpretation (the performance) of the work until the techniques of how to perform it are solid, the conductor must understand and learn the work first. Once learned, it is up to the conductor to use the performance techniques at his or her disposal to make the orchestra perform the work in the desired manner. The sheet music that a conductor uses is known as a score. When scores are published they are usually typeset. The originals, as written by the great – and not so great – composers, have historically been written by hand. The score contains all of the parts that each instrument of the orchestra plays for the piece. In the score the instruments are grouped together by section. As a historical convention, the orchestra score will generally have the woodwinds at the top of the page. Below the woodwind section is the brass section. The strings come at the bottom of the page. Between the brass and the strings are generally located the “other” sections. In eighteenth century scores the most common and generally the only instrument in the “other” section is the timpani. (Yes, timpani could be a plural noun, but it usually refers to one performer playing two or more kettledrums.) At the time, the main exceptions to this one part between the brass and strings were (1) when singers and choir were added above the strings in choral works such as masses, operas, and other pieces with vocal parts and (2) when there was a soloist in concertos. The layout of the score is such that the conductor (or anyone studying the score) sees the first measure at the top of the first page. The top instrument is usually the first flute and, as the eye goes down the page, the music aligns to show the first measure of every instrument. Because of the convention discussed above, a conductor, even when sight-reading a score, can see what is to happen at any moment in each part. Sometimes a composer will want to have one or more players switch to a different instrument. Frequently, a flutist will be told to switch to piccolo or an oboist will be told to switch to English horn. These indications are noted in the score. When a player is asked to play a second instrument, it’s known as “doubling.” For budgetary reasons in the recording industry, this became a common practice in the twentieth century. For example, a producer could hire two woodwind players who could “double” on flutes, oboes, clarinets, bassoons, and/or saxophones, creating an entire woodwind section. Just as the score might request a player to switch to another instrument, the score may have many other instructions in it. For example, it may tell the brass instruments and strings to use a mute. (Yes, for those who didn’t know, there are mutes for strings as well as brass.) Hence, the score will indicate when to insert the mute and when to remove it. Perhaps the most flexible section is the percussion. Two percussionists may be asked to play bass drum, snare drum, tom-tom, cymbals, triangle, glockenspiel, xylophone, chimes, cowbell, and wood block, among many others. Sometimes, especially when budgets are tight, they may be asked to play two of these at the same time. The score will generally just show what instrument is supposed to be played, not by whom or how. In fact, the score will contain most of the composer’s wishes as to how something is to be played, because a sophisticated orchestrator knows that more detail generally provides more control. Take a minute to think about the art form. Hundreds of years ago, a composer created a work, by writing the score. But, music is not paper. An orchestra must perform the work to make it sound. It is a performance medium, just like dance. In the years, decades or even centuries since a piece was composed, technology changes. The make-up of the orchestra may change too. Instruments that are popular may just be a fad of their time. This can be seen, as mentioned above, in the history of rock music. When electric guitars became popular in the 1950s, the “rock band” was – and still is – a work in progress. Looking at old television programs of the time, we might see a double bass (unamplified) and/or a piano playing with a guitar and drums. In the 1960s many bands were trying to differentiate themselves, using harpsichord, glockenspiel, or organ as well as a variety of percussion effects. So, returning to the orchestra and what a composer will write for, it’s not a consistent medium. In fact, it’s kind of a crap shoot. And it was surely true for composers of the eighteenth century. The orchestra changes were dramatic, especially as the keyboard instrument known as the clavichord morphed into the piano e forte. As it became possible to build bigger halls, instrument manufacturers began to look for ways to make the sound of the keyboard instruments of the day louder. The only way to increase the volume of the harpsichord, because it plucks its strings, was to add more strings. More strings made the instrument more complex and also more problematic with intonation. With the introduction of the piano, the performer could control the softness and loudness simply by hitting the keys more softly or with more force. What does a score look like? The score displays the music vertically. This permits the conductor – or anyone studying the score – to see at a glance everything that is happening at one time by looking down the page at any one measure. For an example, see the first page of the Beethoven, Egmont Overture (Example 1). Note that the instruments are listed along the left margin of the score. 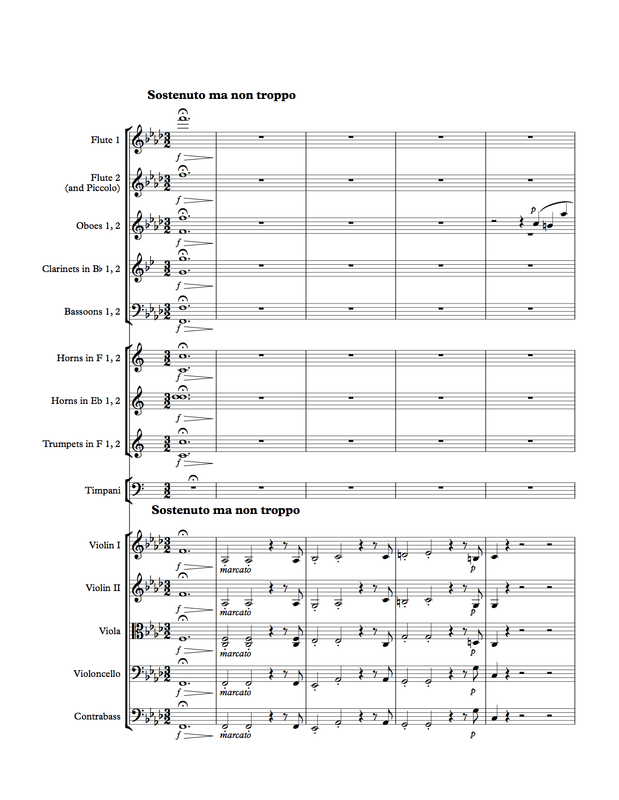 Because a score is usually many pages – in larger orchestral works a score can reach into the hundreds of pages – the instrument names are frequently omitted after the first page. They are reiterated when a new movement begins. Careful readers may see that the notes in the clarinet, horn, and trumpet parts are not Fs. Because these are “transposing” instruments and traditional scores are written as “transposing” scores, the note these performers play and the note they sound are different. More about this will be explained in a later post. This commentary/FAQ has provided answers to some of the basic questions that are frequently asked about reading a score. The next commentary will focus on the Egmont and other works that will help in the learning process.